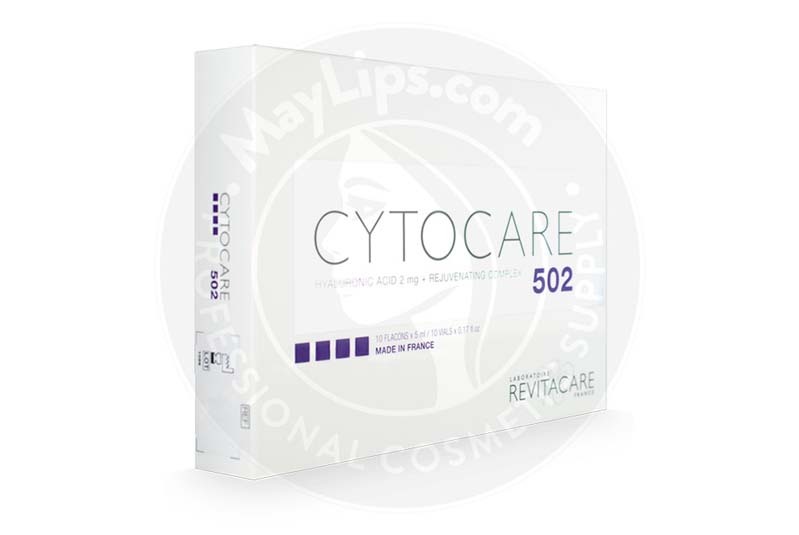 Cytocare 502 is an injectable implant formulated with hyaluronic acid and CT50 rejuvenating complex that helps prevent signs of aging by regenerating and repairing the internal qualities of the dermis. 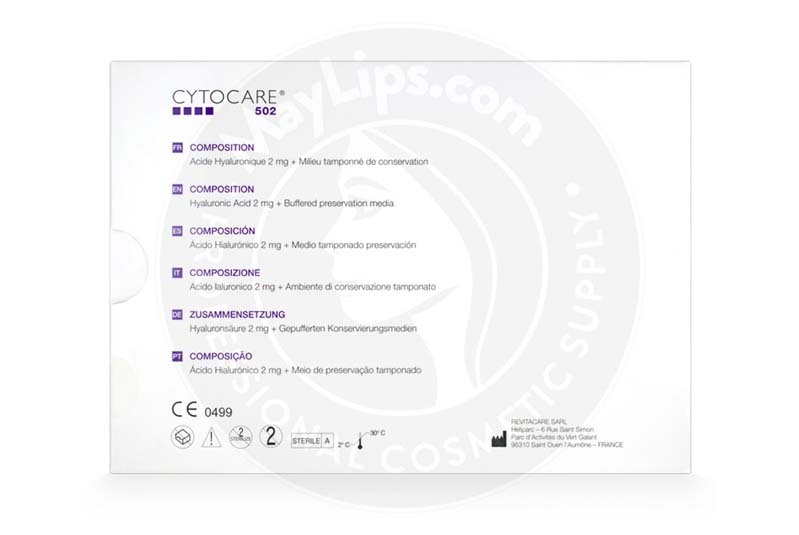 This bioresorbable filler is part of the Cytocare range of Class III medical device products manufactured by Revitacare Laboratories in France. 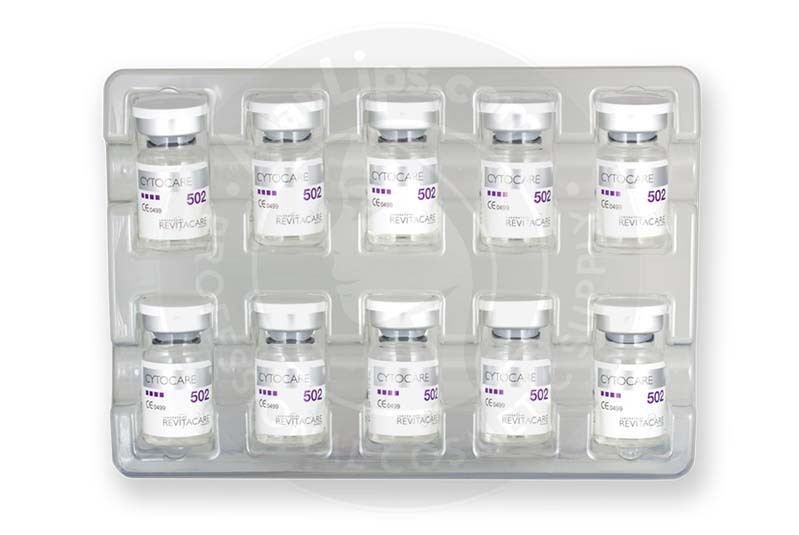 Each box comes with 5 vials containing 5ml of solution, or 10 vials with 5ml of solution that should be stored in conditions between 2°C to 30°C. This filler is formulated for younger skin, typically in patients between the age of 25 and 35, to delay the appearance of wrinkles and restore hydration to the skin. This specially formulated dermal filler is designed to slow the signs of aging by preventing the formation of and reducing signs of wrinkles. Cytocare 502 brings renewed radiance to the skin through high hydration and intense redensification of the dermis for a glowing result. Use this filler to treat the skin all over the face, neck, and back of the hands, but do not be use for dark circles, glabellar wrinkles, or in the lips. The rejuvenating formula is full of multivitamins and essential amino acids that restore compounds within the skin, so individuals radiate health and vitality from the inside out. 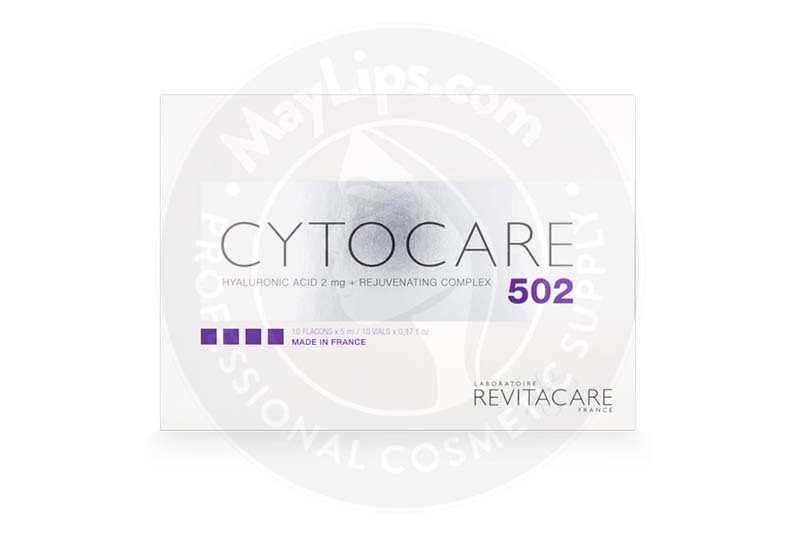 Cytocare 502 is injected into the superficial dermis to smooth fine lines and wrinkles, rehydrate skin, and improve density and overall radiance of the skin. The hyaluronic acid present in the solution restores the internal environment of the skin by replacing the naturally depleted compound, while vitamins and inorganic salts improve circulation and cellular respiration within the cells. This process helps to regenerate tissue and restore the epidermal barrier. New cell growth is promoted due to the presence of dimethyleminoethanol, which stimulates fibroblast and myofibroblast activity. Additionally, vitamins provide protection for the skin and introduce antioxidant activity. All of these processes combine to preserve the elasticity of the skin and give a refreshed, rested appearance and youthful radiance. Cytocare 502 is fast-acting, with results showing immediately. Due to the biological targeting of this filler, results maintain the natural appearance of the skin, ensuring continued expressiveness and naturally healthy looking skin. This filler should only be injected by a medical practitioner and the patient’s medical history should be discussed prior to treatment. 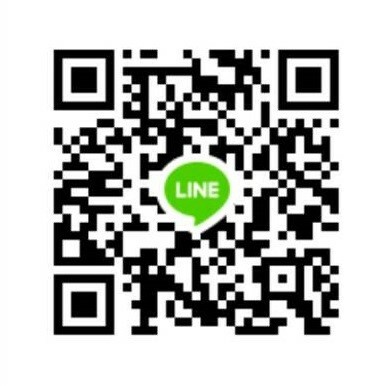 Cleanse and disinfect the area with an antiseptic. Use a 30G hypodermic needle to administer the injection. 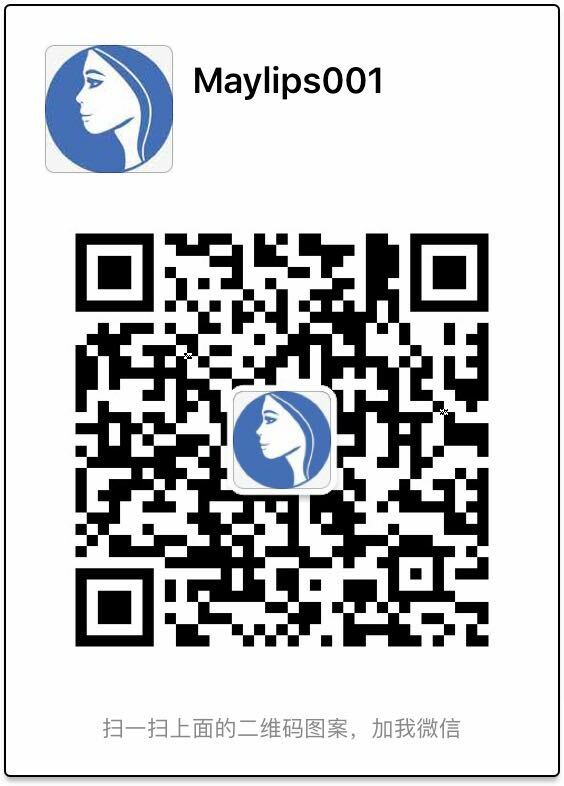 Inject Cytocare 502 into the face or the neck. The manufacturer recommends using either a nappage or point by point injection technique for best result, with the technique used dependent upon the area being treated. Apply the injection slowly and with even pressure. Massage the treatment area gently once the needle is removed in order to ensure even distribution. Administer the treatment in 3 sessions over 3-week intervals, though the number of sessions and the concentration of solution used may vary depending on the condition and maturity of the skin. Results will vary depending on a variety of factors, but clinical trials suggest that the effects of treatment will last for an average of 3 months. The manufacturer also suggests that results are best maintained by continued touch ups administered by 1 session every 3 months. The effectiveness of treatment and best practice for maintenance will depend on the age and lifestyle of the patient, as well as the application technique used and area treated. Other than the typical mild side effects and possible reactions, Cytocare 502 is completely safe and biocompatible as a non-cytotoxic, non-irritant, non-sensitizing, and non-mutagenic solution with assured microbiological safety. This filler has been used countless times and was tested for safety in clinical trials before being allowed on the market, so safety is secured. There are some common side effects and potential reactions associated with the use of Cytocare 502 of which all patients should be made aware prior to treatment. These reactions usually occur immediately and resolve themselves without interference within 2 to 3 days. Advise patients to reach out if they experience any prolonged effects and any reactions experienced that are not mentioned in the manufacturer’s leaflet. There are contraindications listed by the manufacturer, advising that this product should never be used: if the patient is pregnant or breastfeeding; or if the patient has a known hypersensitivity or allergy to hyaluronic acid or any other component present in the ingredients list. What is Cytocare 502 made of? Cytocare 502 is made primarily of non-crosslinked hyaluronic acid at 2mg concentration and rejuvenating complex CT50. For enhanced antioxidant effect, this product contains a multivitamin complex made of thiamin, retinol, nicotinamide, riboflavin, pyridoxine, dexpanthenol, ascorbic acid, tocopherol, and ergocalciferol. For a full list of all active ingredients, refer to the product leaflet. Ingredients: Hyaluronic acid, multivitamin complex (retinol, thiamin, riboflavin, nicotinamide, dexpanthenol, pyridoxine, ascorbic acid, ergocalciferol, tocopherol), Ammonium Molybdate, Ammonium Metavanadate, Calcium Chloride, Iron Sulfate, Potassium Chloride,Copper Sulfate, Magnesium Chloride, Manganese Sulfate, Sodium Acetate, Sodium Hydrogen Carbonate, Sodium Chloride, Sodium Hydrogen, Phosphate, Sodium Metasilicate, Sodium Selenite, Nickel Chloride, Tin Chloride, Zinc Sulfate, Alanine, Arginine, Asparagine, Aspartic Acid, Cysteine, Glutamine, Glutamic Acid, Glycine, Histidine, Isoleucine, Leucine, Lysine, Methionine, Phenylalanine, Proline, Serine, Threonine, Tryptophan, Tyrosine, Valine, Adenine (Vit.B4), Biotin (Vit.B8), Calcium Pantothenate, (Vit.B5), Choline Chloride, Folic Acid (Vit.B9), Inositol (Vit.B7), Nicotinamide (Vit.B3), Pyridoxine (Vit.B6), Riboflavin, (Vit.B2), Thiamine (Vit.B1), Vitamin B12, Deoxythymidine, Glucose, Putrescine, Sodium Pyruvate, Lipoic Acid. Size: 10 vials x 5mL.